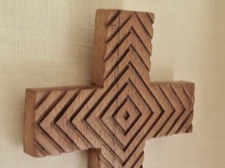 Carefully rendered cross with a grooved geometric design. 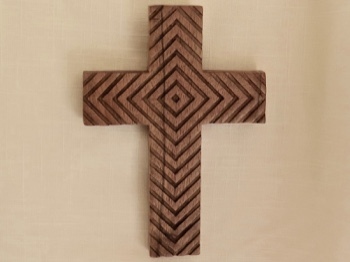 This handcarved cross is made from raintree wood on the island of Bali. Rain Tree, or Monkey Pod, is an umbrella shaped tree that can grow 80 feet tall producing a wonderful canopy that is wider than the tree is tall! It is a tree that naturalizes freely, so it is considered a useful, sustainable wood source in Bali. 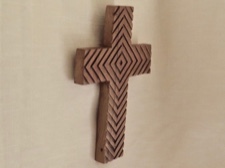 This cross measures 10 inches tall, 7 inches wide, and is .75 inches thick. It has a natural, smooth finish and would make a great gift to yourself or to someone you care about.